Blood supply to the thyroid gland. The thyroid has an abundant blood supply. The arterial supply comes from the inferior and superior thyroid arteries. The right and left superior and inferior thyroid arteries anastomose extensively within the gland. 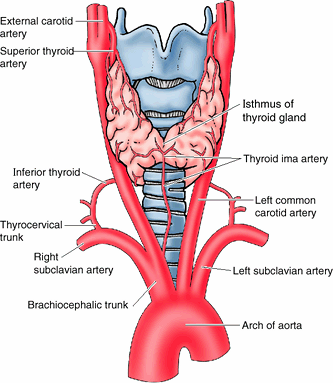 The superior thyroid artery arises from the external carotid artery on each side and descends several centimetres in the neck to reach the upper pole of each thyroid lobe. It is related to the external laryngeal nerve, pierces the thyroid fascia and then divides into anterior and posterior branches. The anterior branch supplies the anterior surface of the gland, and the posterior branch supplies the lateral and medial surfaces. The inferior thyroid artery arises from the thyrocervical trunk of the subclavian artery, crosses beneath the carotid sheath and enters the lower or middle part of each thyroid lobe and divides into superior (ascending) and inferior thyroid branches to supply the inferior and posterior surfaces of the gland. 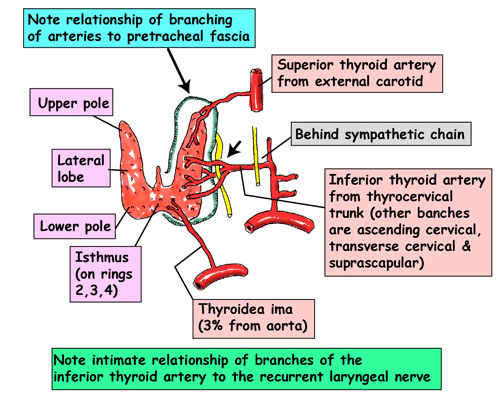 The relationship between the inferior thyroid artery and the recurrent laryngeal nerve is very important clinically because it is highly variable. Injury to the nerves supplying the larynx represents a major complication. The thyroid ima artery (Latin. The arteria thyroidea ima) presents approximately in 10% of people, and may arise from the arch of the aorta, brachiocephalic trunk, or from the right common carotid, subclavian, or internal thoracic arteries. It ascends to the anterior surface of the trachea, which it supplies, and continues to the isthmus of the thyroid gland. The presence of the artery should be considered when performing procedures in the midline of the neck inferior to the isthmus, because it is a potential site of bleeding. Three pairs of veins usually form a thyroid venous plexus on the anterior surface of the thyroid gland: the superior, middle and inferior thyroid veins. 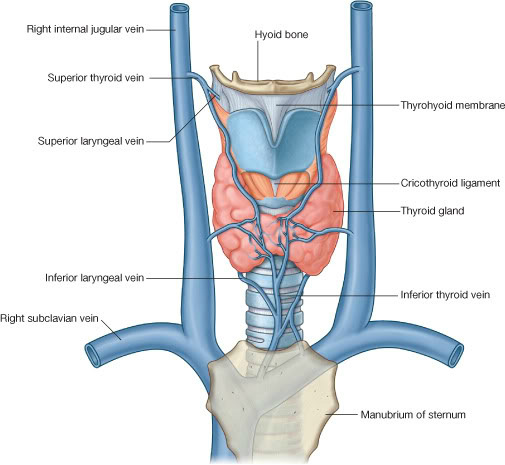 The superior thyroid vein emerges from the upper part of the gland, and runs with the superior thyroid artery, draining into the internal jugular vein. The middle thyroid vein collects blood from the lower part of the gland. It emerges from the lateral surface of the gland and drains into the internal jugular vein. The inferior thyroid veins arise in a glandular venous plexus which connects with the superior and middle thyroid vein. These veins form the paratracheal plexus from which the inferior vein descends to drain into the left brachiocephalic vein, and the right descends across the brachiocephalic artery to join the right brachiocephalic vein. The inferior thyroid veins often drain via a common trunk into the superior vena cava or left brachiocephalic vein. They drain the tracheal, inferior pharyngeal and oesophagus veins.